Use the Sort menu to sort results by relevance, number of stars, number of forks, and how recently the items were updated. To sort by interactions, reactions, author date, committer date, or how recently the items were updated, you can add a sort qualifier to your search query. The sort:interactions qualifier sorts by the highest combined number of reactions and comments. sort:interactions or sort:interactions-desc org:github sort:interactions matches issues in repositories owned by GitHub Enterprise, sorted by the highest combined number of reactions and comments. sort:interactions-asc org:github sort:interactions-asc matches issues in repositories owned by GitHub Enterprise, sorted by the lowest combined number of reactions and comments. The sort:reactions qualifier sorts by the number or type of reactions. sort:reactions or sort:reactions-desc org:github sort:reactions matches issues in repositories owned by GitHub Enterprise, sorted by the highest number of reactions. sort:reactions-asc org:github sort:reactions-asc matches issues in repositories owned by GitHub Enterprise, sorted by ascending number of reactions (the fewest to the most). sort:reactions-reaction org:github sort:reactions-+1 matches issues in repositories owned by GitHub Enterprise, sorted by most thumbs up ( ) reactions. org:github sort:reactions--1 matches issues in repositories owned by GitHub Enterprise, sorted by most thumbs down ( ) reactions. org:github sort:reactions-smile matches issues in repositories owned by GitHub Enterprise, sorted by most laugh ( ) reactions. org:github sort:reactions-tada matches issues in repositories owned by GitHub Enterprise, sorted by most hurray ( ) reactions. org:github sort:reactions-heart matches issues in repositories owned by GitHub Enterprise, sorted by most heart ( ) reactions. The sort:author-date qualifier sorts by descending or ascending author date. sort:author-date or sort:author-date-desc feature org:github sort:author-date matches commits containing the word "feature" in repositories owned by GitHub Enterprise, sorted by descending author date. sort:author-date-asc feature org:github sort:author-date-asc matches commits containing the word "feature" in repositories owned by GitHub Enterprise, sorted by ascending author date. The sort:committer-date qualifier sorts by descending or ascending committer date. sort:committer-date or sort:committer-date-desc feature org:github sort:committer-date matches commits containing the word "feature" in repositories owned by GitHub Enterprise, sorted by descending committer date. sort:committer-date-asc feature org:github sort:committer-date-asc matches commits containing the word "feature" in repositories owned by GitHub Enterprise, sorted by ascending committer date. The sort:updated qualifier sorts by how recently the items were updated. 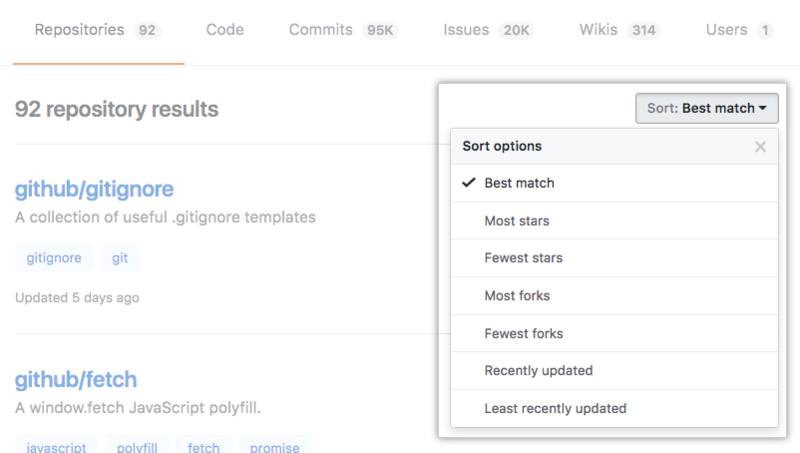 sort:updated or sort:updated-desc feature sort:updated matches repositories containing the word "feature," sorted by most recently updated date. sort:updated-asc feature sort:updated-asc matches repositories containing the word "feature," sorted by least recently updated date.